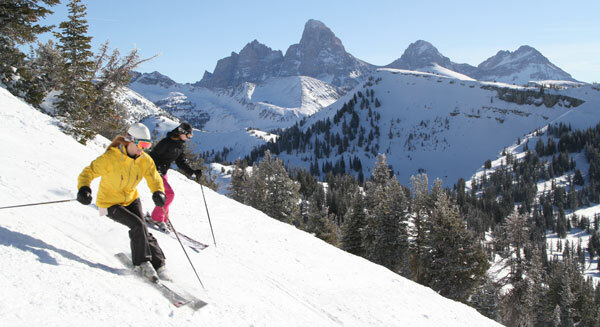 Grand Targhee Resort is perfect for skiing families. It’s one big small ski resort – big skiing with 2,602 acres of super scenic terrain and over 500-inches of snow annually, with a small base village – nothing fancy but everything you need for a family ski vacation from lodging and kids’ ski and snowboard camps, to an outdoor heated salt water pool and sleigh ride dinners. Targhee frequently offers great deals for like “kids stay, ski and eat free” with reserved resort lodging. Grand Targhee offers perfectly pitched ski terrain, nothing is super steep, and it’s often covered in fresh snow with wide open bowls and groomed trails. The views of the Grand Tetons are superb from the summit of Fred’s Mountain at 9,862’. Just four lifts serve Fred’s and Peaked Mountain, but there is plenty of terrain to keep you amused for a week, plus there is a kid pleasing terrain park and a Screaming Cheetah trail –a veritable pinball alley on skis or a snowboard. Grand Targhee offers cat skiing on an additional 600-acres for a reasonable $350 for the day, or $199 for a few hours. Grand Targhee started in 1969, and it still has that classic ski resort feel. There are just 100 simple ski in/ski out lodging units in the mountain village (circa 1970) plus three cozy restaurants and pubs, a few shops, and a family activity center. Lodging in the Sioux, Teton and Teewinot Lodges is rustic, nothing regal, ranging from hotel rooms to two bedroom units, just steps from the slopes. The focus here is on skiing – but there is a roster of family fun besides, you can snowtube, watch an avalanche dog demonstration, snowshoe with a naturalist, cross country on the 15-kilometers of groomed terrain, snowbike (Targhee is the first ski resort to offer fat tire bikes that stay on top of the snow for fun winter riding on groomed Nordic trails), or soak in the outdoor heated salt water pool and hot tub. Grand Targhee has daily kids’ camps for skiing and snowboarding, ski patrol avalanche rescue dog demonstrations, even kids’ movie/game nights so mom and dad can enjoy apres ski. Apres Ski at The Trap Bar rocks at the Ghee. There’s only one ski bar, so its where everyone goes – locals, patrol, visitors alike. The lively but humble slopeview bar above the base lodge brings in top bands, and folks drink beer and dance in ski boots most afternoons into the evening. Miller’s Sleigh Ride dinner is a must- a classic western experience, this is not a Disney-production, this is the real deal with a downhome meal in a cozy woodfired yurt – served by cowboy Miller himself. He drives the sleigh and steers the two beautiful draft horses then heaps your plate with handmade scones in honey butter, Wydaho mash potatoes and a delicious seared steak . The sleigh ride evening is $40, BYOB and bundle up for the short but snowy sleigh ride through the beautiful forest. Grand Targhee is beautiful, surrounded by National Forest, part of a wildlife corridor, so its not unusual to see big game grazing near the slopes. Grand Targhee is located up a 12-mile curvy access road from the nearest town of Driggs, Idaho, and an hour of Jackson Hole, Wyoming. So you can take a day of the slopes to visit Yellowstone, The National Elk Refuge and Grand Teton National Park, or you can just enjoy the relaxed friendly vibe on the slopes. In just a few days you and your kids will know the names of the lift attendants, instructors, Slim the cowboy, Fred the Moose mascot, and the ski patrol dogs. It is one big happy Targhee family, no attitude just genuine Wydaho hospitality and a shared love of skiing.